At least five portions of fruit or vegetables a day are good for us. Yet encouraging children to get into the habit of healthy eating when there are so many other temptations around is hard. Research suggests that a balanced diet that includes a lot of fruit and vegetables will help children stay more alert at school and be less likely to develop behavioural problems or sleep disorders. Yet many children simply won’t eat what’s considered ‘good for them’, while some are fussy, and may only eat one or two types of fruit. There are several things you can do to encourage your children to eat more healthily. 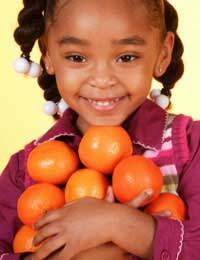 Children love sweet food, and fruit is a great source of natural sugars. To encourage your children to eat more fruit, they need to see you enjoying it as part of a healthy diet. Make family mealtimes part of your daily routine and serve up a healthy variety of foods, including fruit. Add dried fruit, such as raisins and figs to their breakfast cereal, and treat them to a fruity pudding after their evening meal. Add a banana or apple, or dried fruit such as mango to their school lunch boxes, or let them snack on grapes or berries. Make fruit kebabs – thread strawberries and chunks of melon and kiwi fruit onto a skewer and drizzle with chocolate. Why not get your children to help you make it? If your children are unused to healthy eating, encouraging your children to eat fruit won’t be easy. You may have to take several knock-backs before they finally agree to try something, but persistence is the key to success. Don’t abolish the junk altogether – let them know both fruit and junk (in moderation) can be enjoyed as part of a healthy diet. And don’t force them to eat fruit. This will only put them off eating it in later life. Just remember that even once piece of fresh fruit a day can help make a difference.